The wildly popular AMC show, The Walking Dead is giving away the Hyundai Tucson that Shane drives while fleeing the brain-eating zombies that have infiltrated the world – or at least the Southeastern United States. A quick recap might be in order. As recounted in an earlier TorqueNews Walking Dead story, Shane, a deputy sheriff, decides he wants to split off from the ragtag group looking for life after the Zombie apocalypse that is the thrust of The Walking Dead. He comes across a Hyundai Tucson abandoned among scores of other vehicles and decides it will be perfect transportation, especially after it starts right up in spite of seating from what must be months. Even better, the stereo works just fine. Sure, all he can pick up are robotic Emergency Broadcast Service messages, but he's in luck if he can find some CDs lying around. Plus with all those other abandoned vehicles sitting around (because the owners all are toast), he's not going to have to pay for gas. 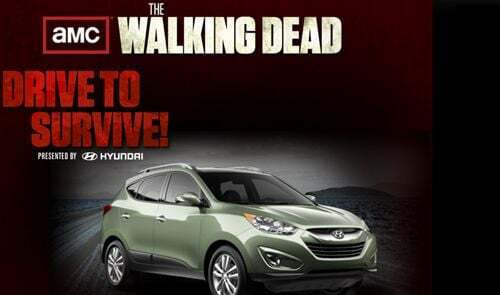 Now you can win that exact Hyundai Tucson from The Walking Dead by heading over to the show's website and click on the Walking Dead sweepstakes link. Pop in the relevant information and you're on your way to driving the crossover that outran the zombies and figured prominently in a lot of different scenes. It's an easy contest to enter. Just fill out your name, address, and email and you're on your way. By the way, why do entry forms not allow you to use your complete zip code + 4? I'm a good boy. I follow the USPS system and actually know my complete zip code. No wonder the post office is going broke. It's important to keep in mind that you can only enter once a day. You can't go off the reservation and use a bunch of different email addresses. The Walking Dead/Hyundai Tucson sweepstakes only allows one entry per day per name. Any more than that and your entries are voided. That's right. You're entries are dead. The only thing that could be almost as good is winning a walk-on role on The Walking Dead. Hyundai Chief Marketing Officer Steve Shannon told me he was offered a role but hasn't been able to fit it into his schedule. For God's sakes man, where are your priorities? Forget the family. Forget your career. Become a Zombie on The Walking Dead. It will give you something to talk about at parties for the rest of your life! By the way, props to Steve Shannon and the Hyundai marketing crew for coming up with the tagline, "Hyundai Tucson: A Crossover for the Living." Nice play on the whole living dead theme. I love this show it's really good . I would love to drive the Hyundai .Especialy this Tucson it's a really cool looking car . I tried to buy the Kia , but my credit was bad . So this would be awesome if I won this Hyundai . My husband and I have lost our jobs ,in so doing our other vehicle was repoed.Now we are down to our old 98 Jeep Grande Cherokee with two kiddos still at home and them needing something decent to drive...MMM?Yeah.Id love to win that sweet little ride!Where do we go to enter? I recently rented this car it is awsome! LOVE IT it drives great hats off to the people that designed this car ! I would sooooo! happy If I won this car .Today is my birthday this would be my wonderfulgift just for me LOL.The color of this car is great.Happy New Years everyone be safe and blessed.